(Phys.org) —A team of astronomers using NASA's Hubble Space Telescope has taken an important step closer to finding the birth certificate of a star that's been around for a very long time. 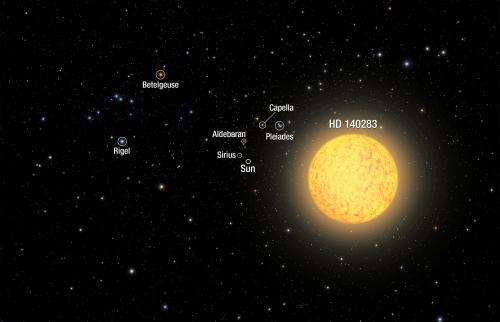 "We have found that this is the oldest known star with a well-determined age," said Howard Bond of Pennsylvania State University in University Park, Pa., and the Space Telescope Science Institute in Baltimore, Md. The star could be as old as 14.5 billion years (plus or minus 0.8 billion years), which at first glance would make it older than the universe's calculated age of about 13.8 billion years, an obvious dilemma. But earlier estimates from observations dating back to 2000 placed the star as old as 16 billion years. And this age range presented a potential dilemma for cosmologists. "Maybe the cosmology is wrong, stellar physics is wrong, or the star's distance is wrong," Bond said. "So we set out to refine the distance." The new Hubble age estimates reduce the range of measurement uncertainty, so that the star's age overlaps with the universe's age—as independently determined by the rate of expansion of space, an analysis of the microwave background from the big bang, and measurements of radioactive decay. 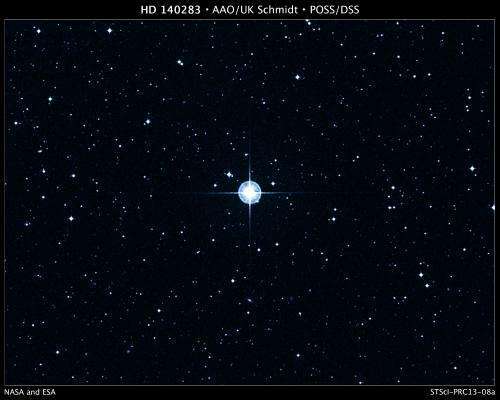 This "Methuselah star," cataloged as HD 140283, has been known about for more than a century because of its fast motion across the sky. The high rate of motion is evidence that the star is simply a visitor to our stellar neighborhood. Its orbit carries it down through the plane of our galaxy from the ancient halo of stars that encircle the Milky Way, and will eventually slingshot back to the galactic halo. The star, which is at the very first stages of expanding into a red giant, can be seen with binoculars as a 7th-magnitude object in the constellation Libra. Hubble's observational prowess was used to refine the distance to the star, which comes out to be 190.1 light-years. Bond and his team performed this measurement by using trigonometric parallax, where an apparent shift in the position of a star is caused by a change in the observer's position. The results are published in the February 13 issue of the Astrophysical Journal Letters. The parallax of nearby stars can be measured by observing them from opposite points in Earth's orbit around the sun. The star's true distance from Earth can then be precisely calculated through straightforward triangulation. Once the true distance is known, an exact value for the star's intrinsic brightness can be calculated. Knowing a star's intrinsic brightness is a fundamental prerequisite to estimating its age. Before the Hubble observation, the European Space Agency's Hipparcos satellite made a precise measurement of the star's parallax, but with an age measurement uncertainty of 2 billion years. One of Hubble's three Fine Guidance Sensors measured the position of the Methuselah star. It turns out that the star's parallax came out to be virtually identical to the Hipparcos measurements. But Hubble's precision is five times better that than of Hipparcos. Bond's team managed to shrink the uncertainty so that the age estimate was five times more precise. With a better handle on the star's brightness Bond's team refined the star's age by applying contemporary theories about the star's burn rate, chemical abundances, and internal structure. New ideas are that leftover helium diffuses deeper into the core and so the star has less hydrogen to burn via nuclear fusion. This means it uses fuel faster and that correspondingly lowers the age. Also, the star has a higher than predicted oxygen-to-iron ratio, and this too lowers the age. Bond thinks that further oxygen measurement could reduce the star's age even more, because the star would have formed at a slightly later time when the universe was richer in oxygen abundance. Lowering the upper age limit would make the star unequivocally younger than the universe. "Put all of those ingredients together and you get an age of 14.5 billion years, with a residual uncertainty that makes the star's age compatible with the age of the universe," said Bond. "This is the best star in the sky to do precision age calculations by virtue of its closeness and brightness." This Methuselah star has seen many changes over its long life. It was likely born in a primeval dwarf galaxy. The dwarf galaxy eventually was gravitationally shredded and sucked in by the emerging Milky Way over 12 billion years ago. The star retains its elongated orbit from that cannibalism event. Therefore, it's just passing through the solar neighborhood at a rocket-like speed of 800,000 miles per hour. It takes just 1,500 years to traverse a piece of sky with the angular width of the full Moon. The star's proper motion angular rate is so fast (0.13 milliarcseconds an hour) that Hubble could actually photograph its movement in literally a few hours. You are limiting the stars age by your BELIEVED age for the universe, when in fact the star may be a piece of remnant evidence telling you that your universe age is actually wrong. Actually it's quite reasonably concievable to measure the age of the universe, and we have quite an accurate measurement of it. They are not "restraining the star's age by the universes age" - they are saying the original measurement was not as accurate as teh current measurement, which happens to allow the star's age range to overlap with the purported age of the universe. @Lurker2358 in no way did this article try and constrain the age of the star beyond what was either directly measured or by what we currently understand about stellar evolution. 14.5 billion years is still older than the estimated age of the universe. It is only by including the possible errors in the estimation ( - 800 million) that the age falls inside the age of the cosmos. It is fair to say that further refinements will adjust the age even lower. Core-collapse SNe spew alpha-process elements, e.g. "oxygen" (since all the iron implodes into the remnant compact object). Whereas thermo-nuclear SNe spew iron peak elements (since the CNO white dwarves obliterate themselves in exploding). Ipso facto, high O:Fe ratios imply the star formed from a mix of space gas, containing residues from CC SNe (which occur quickly, from big bright fast-burning stars); but before residues from TN SNe (which occur later, after small stars age into white dwarves) entered the mix. Et ipso facto, high O:Fe implies the star formed earlier, and hence is older. Yes ? high O:Fe implies the star formed earlier, and hence is older. Yes ? Google up "Star Metallicity Population classification" for more complete descriptions. Still another kluge to the Big Bang Fantasy. Clearly stellar evolution models are wrong. Assumptions piled on top of assumptions in this article. It would appear to be a rogue star, perhaps captured from some other source. assumptions about the required conditions for various nuclear reactions. The actual conditions for a star cannot be modeled, even in a laboratory, because the laser fusion facilities do not "actually" model stellar core conditions, only stellar core temperatures for like a picosecond. So they get a nuclear reaction, but what they get can't reasonably be what is "really" happening inside a star under sustained temperature and pressure. "Hubble finds birth certificate of oldest known star"
note "oldest known". their are probably older stars out there but we dont have the ability to detect them as they are small slow burning stars which dont stick out outside of our galaxy as much as inside. I can see that an uncertainty factor for this star is given in the article. But the article appears to be treating the age of the universe as an absolutely precis number (yeah, right), without uncertainty and this would add an influence as to which side of the universe's real starting date that stellar birth truely might have taken place. That does make the whole story a bit one sided. So, can anybody give an idea of what the overal uncertainty for the calculations and data is, that determines the overall age of the universe itself? And, since uncertainties have a nasty habit of interacting and combining, just how might this other uncertainty impact on the final result for the star? When they estimate the age of a star from it's luminosity, are they considering interstellar dust/clouds that may interfere with light ? This one (could also plus other cosmological data) is a clue for us that "The Big Bang theory" is really need evaluation or at least little revising. I told you before: THERE WAS NO BIG BANG! A fascinating star, one the Hubble can even detect moving. It's great age make it a huge draw for more intense study - has it any exoplanets I wonder? Actually a Star like this can strengthen the case for the Big Bang model. The age is within margin of error quite near to the calculated Age of the universe. And there is no such thing as "oldest" star. In fact there are millions of "oldest" stars since within a few million years of the Big Bang stars were forming all over the place. In a few years they probably will start finding stars of a similar age , but not more in the Andromeda galaxy. If you detect a Star so old it means that the cosmic "soup" of H2 after the Big Bang was very well distributed to every corner of the Universe. The key here is 'unpolluted.' This star is long lived due to its pure gas birth. In looking at our zoo now do we see stars being born in this 'unpolluted' environment of pure gas? They would have the characteristics of being perfect spheres and have rotations of very slow periods and be dim due to not burning fast. If they exist they would be very hard for us to see. it's just passing through the solar neighborhood at a rocket-like speed of 800,000 miles per hour. It takes just 1,500 years to traverse a piece of sky with the angular width of the full Moon. The star's proper motion angular rate is so fast (0.13 milliarcseconds an hour) that Hubble could actually photograph its movement in literally a few hours. Pretty spry for an Ancient. The Big Bang is a hypothesis. You can't use a theory or hypothesis as evidence of itself, moron. Therefore you cannot use the Big Bang Theory (Hypothesis really,) nor anything dated based on that theory, as a limiting factor when determining the age of anything in the universe. The age of objects MUST be interpreted as evidence for or against any theory explaining the minimum age of the universe, because "existence" can't be younger than it's contents. The only way they date the universe is by calculating what they think is the age of radiation or objects contained by the universe, and saying the universe must be at least slightly older. the way you people treat this, you would throw out the evidence of the star's age, just because it's older, which is the wrong thing to do. The existing model and calculated age of the universe must be changed to fit the evidence, not the other way around. BB is almost certainly wrong anyway, for reasons too complicated to discuss here. So, this is the modification. Assume there was a real "Big Bang". Then from a point of that "Bang" happening, cosmos objects to spread away to entire directions. In GR language, the space expands. But we need to modify something. We need to revise the age of the Universe, since 13.7 billion years is extremely too young for the Universe, and we have been aware that. Many cosmological observations have indicated that. Keep with us all regulations, observations, theories (with all honest & sincere improving interpretations & translations). Fellows, 13.7 billion years for Universe age is extremely too small. The age of Universe is infinite, or Universe is eternal. Mark the point we assume the "Bang" to happen as Universe nucleus, while (with new interpretation) the "Bang" is still going on and on, eternally. And again, we have noticed its place. It is behind between Ursa Major and Leo constellations. Then, we will get the Universe structure is actually "Cloud and rain model." I still belive time is relative. Why we bother so much the linear-time when we have more than enough space to all diraction and level? This "little" star show us people to think over the age of visible universe and find the error. 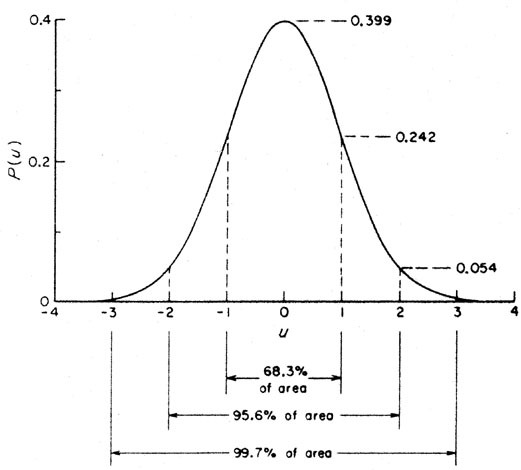 We assuming datas and beliving in science its only one way to find the truth, other way to have a good question. Expl. When the extra dimension left our plane of existance? How about if it left never and exist right under our feet through the stars which is the time of our beloved holographic universe. We thought enough old style, let start to think different. So, can anybody give an idea of what the overal uncertainty for the calculations and data is, that determines the overall age of the universe itself? "we can estimate the age of the universe to about 0.4%: 13.77 ± 0.059 billion years!" we can estimate the age of the universe to about 0.4%: 13.77 ± 0.059 billion years! ,,, positive violation of the AWT electron duck principle. Universe riding on the backs of electron ducks transversely through the aether,, it that what ya meant to say? The whole CMBR based support of Big Bang cosmology is a nifty example of circular reasoning, because the existence of CMBR is explained like the consequence of expansion of photon wavelength during its aging - well, and the age of Universe is derived from wavelength of CMBR photons expanded. Nope, wrong way round. The age is determined from the Hubble Constant and measurements of density. That can then give the redshift, but there are many other checks too. In AWT the Universe is steady-state and the red shift is the consequence of light scattering with density fluctuations of vacuum in similar way, like the changes of wavelength of ripples during their spreading along water surface. However, water ripples don't change their wavelength in water of constant depth. This simple model can be falsified experimentally, ..
and it was even before Zwicky proposed it as he noted. Exactly, WMAP gives the model parameters and the Hubble constant is then a scaling factor. Light is in the bulk of the vacuum, surface waves are not a valid analogy. Neither bulk nor horizontal transverse waves exist in water. why this scattering wasn't considered in interpretation of red shift already? As I have told you many times before, Zwicky pointed out in the very first paper that ever suggested the Tired Light model that scattering is not a possible mechanism, it was already well known that scattering is frequency dependent while cosmological redshift is not. Some other explanation would be required if Tired Light hadn't already been falsified.